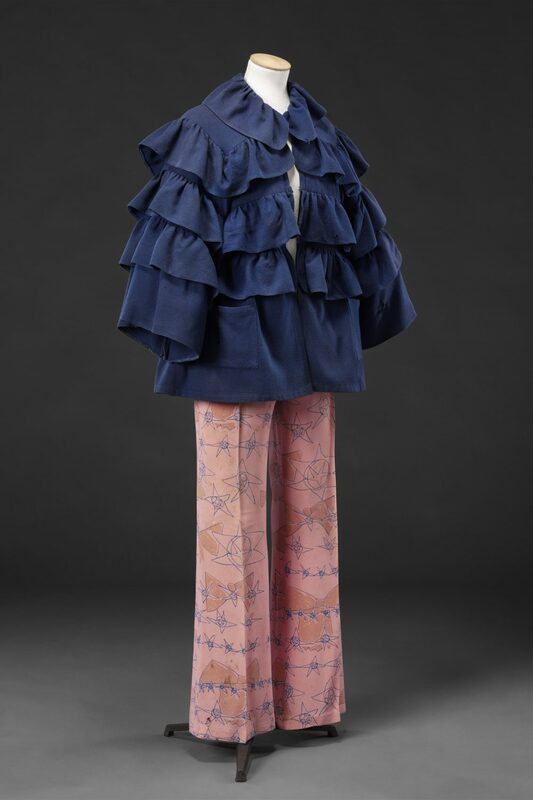 The trousers and jacket are part of a small collection of clothes designed by Foale and Tuffin that were worn and donated by Dinah Collin. Marion Foale and Sally Tuffin were educated at Walthamstow College of Art (where they were fellow students of John Bright) and the Royal College of Art. In 1963 they opened their first boutique at 1, Marlborough Court, just off Carnaby Street in Central London, and were at the forefront of the group of young innovative designers and musicians that earned the city the title of ‘Swinging London’ in the mid 1960s. Their clothes were championed by the influential fashion journalist Marit Allen, who later became a film costume designer, and were worn by the trendiest models and actresses of the day. 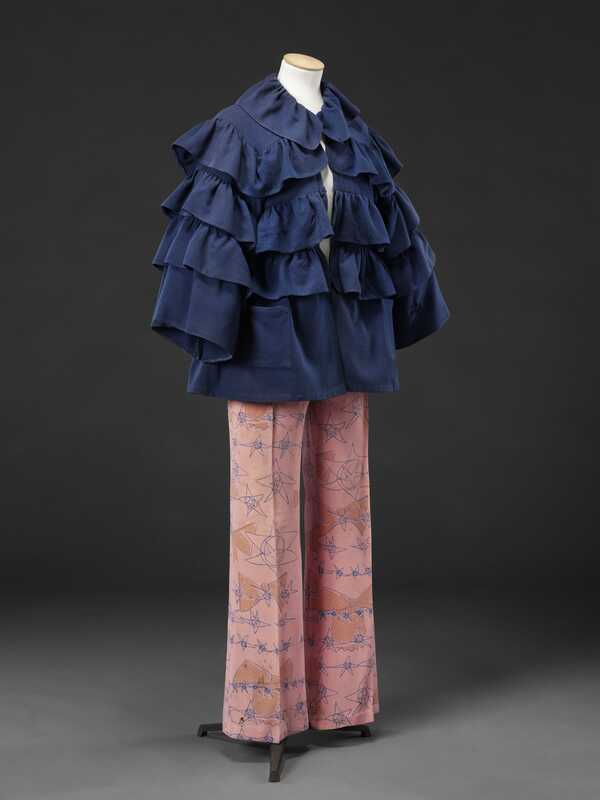 Their style, which was quite graphic in the middle years of the decade, became more romantic and flowing by 1970, often influenced by ethnic and oriental dress. In 1972 Marion Foale left the business, and Sally Tuffin continued under her own name. 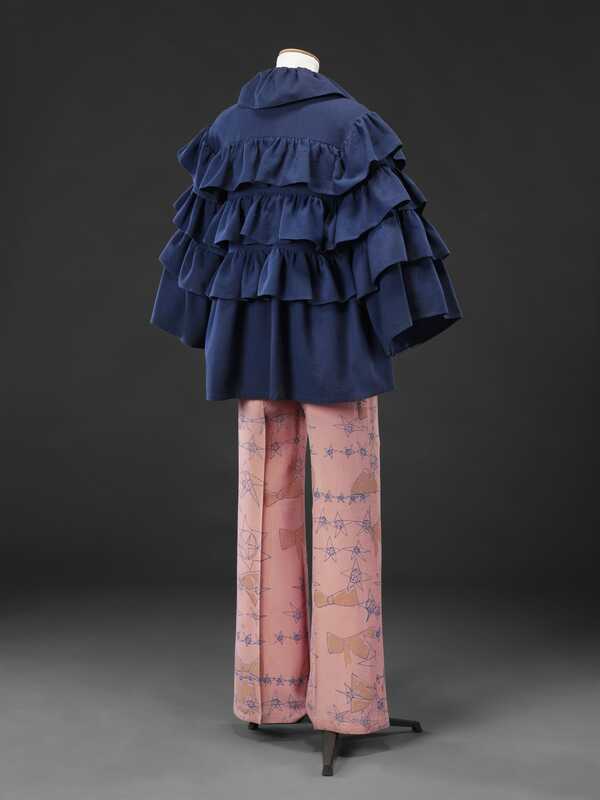 The crepe trousers are printed with a stars and bows pattern probably designed by Zandra Rhodes who contributed a number of textile designs to the company; they date from the later years of the Foale and Tuffin partnership, while the unlined flounced wool jacket with patch pockets would have been acquired shortly after they had gone their separate ways. A floral version, part of the pair’s last collection ‘Coco Frills’ of 1972, was illustrated in 19 magazine, retailing at £18.50.